Colombia headed into the match as favourites to beat Japan and top Group H on Tuesday. But their mission suffered a massive blow less than 180 seconds into the game, reports Express.co.uk. Japan burst forward and Yuya Osaka had a chance to score early on from a one-on-one. His effort was saved before Shinji Kagawa was blocked by Carlos Sanchez, who stuck out an arm to deny a clear goal. And referee Damir Skomina was left with no choice but to send the Fiorentina player off. Sanchez, who will now be suspended, could face further repercussions for refusing to immediately leave the field of play as Colombia’s players protested the decision. According to Opta, the 2:56 clocked means Sanchez’s is the second fastest red card in World Cup history. Only Uruguay’s Jose Alberto Batista has received a faster dismissal. He was sent off in a clash against Scotland in 1984 after just 54 seconds. 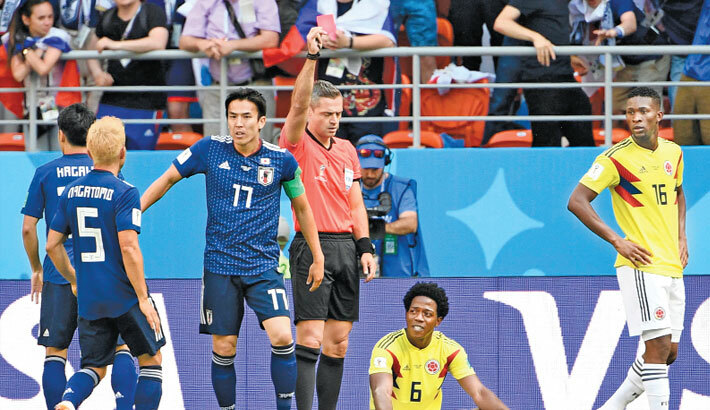 Shinji Kagawa converted the penalty with a cool finish as Japan took a 1-0 lead, but Colombia brought the scores level by half time.